It's day 3 of the WPlus9 October release. Today I'm featuring the adorable new set, Drummer Boy. These little guys are too cute. 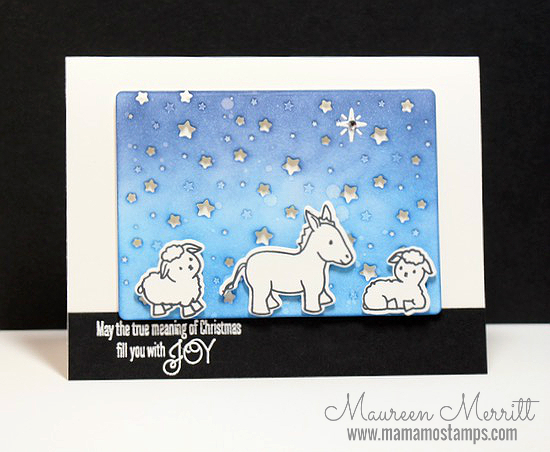 I want to pick up that sheep on the left and hug him ;) I paired these soon to be released images with the Starry Background die from the last release and I think they are perfect together! I love that these critters look great whether they are colored or not! Sweet card Maureen. I know what you mean about hugging them, they ARE adorable! I love you card! So sweet. These critters are so sweet! I want to hug them too. I wish I knew how to color white animals without having them looking dingy gray.